Hands down the most pretentious work of pulp fiction I have ever read, Samuel R. Delany’s Nebula-winning 1967 The Einstein Intersection is a riot of crinkly prose, mythological overlapping, lightweight treatments of fascinating topics and adventures ranging from planetary romance battles against carnivorous flowers to western-style cattle-drives – with dragons. It is wildly memorable. Also it’s about 100-150 shorter than it needs to be. Despite being an adventure sci-fi, it is very closely patterned on the classic intellectual novel of ideas where everything is a metaphor and culture highlights every page. Authors can do that with any genre – sci fi, western, erotica, chick lit, maybe even comedy – but this example is from the distinctly shallow end of the pool. Some will prefer it for that reason. It has its good points, combining as it does brilliant imaginative gambits with action sequences and language that’s not too abstruse. It’s a blast to read. And it’s either overreaching or underdone. Possibly both. I’m a rookie in the science fiction field trying to get a taste for it but The Einstein Intersection never gave off the aura of sci-fi in the first place. Plot: In the far future humans have moved on and an alien race have come to inhabit our abandoned shells. Unfortunately, they are devolving into mutants. One of them, Lobey, gifted with music, sets out to find his love Friza, the latest to die by a mysterious hand. He leaves his village, battles a minotaur, travels with dragon herders haunted by the spectre of a supernatural Billy the Kid and arrives in a city where the myths of Orpheus and Christ are about to go down. For sheer invention, this is really fine stuff unless you’re allergic to the remotest hint of cheese. Biggest cringe moment on display is the “myth of the Beatles.” Apparently, in the future the Fab Four are part of the pantheon of gods. Yeah, that dates it. Delany’s expert eye for mythological archetype allows him to draw some thoughtful parallels nevertheless: the Beatles are torn apart by fangirls (shades of Dionysus there) and later reform into a singular entity (like Osiris, perhaps?). However, this idea is given exactly one paragraph, not really enough to justify its place in the narrative. And that’s a shame, since he easily could have done so. That’s pretty much the recurring flaw of the book. Delany’s hip erudition is on display in every chapter’s epigraph – he quotes Erasmus, Sartre and Chatterton as easily as Bob Dylan and Pepsi taglines, plus proves himself on speaking terms with Gregory Corso and gives excerpts from his travels to Istanbul, Venice, Greece…. (Lucky dog.) But, because he doesn’t show much skill in developing his ideas all of this feels rather like showing off, or worse, hoping the quotes will do the work for him. He tells the story; Ruskin and Lagerkvist fill you in on the deeper meaning. Only it doesn’t work that way. My copy of Einstein is only 142 pages long but he had more than enough material here for a much longer work. For instance, the themes touched upon include: interwoven myths; gender confusion; bigotry; the violence that springs so naturally from men; death and its meaning; the pursuit of love and questions of its significance and reality; promiscuity as a necessity of the gene pool; androgyny as a positive difference; whether we are doomed to repeat the myths (and thus the mistakes) of those who came before; the healing and connecting power of music… I could go on. A man who has published as much as Samuel Delany can’t ever be called lazy but I don’t know what else to call this much brilliant, wasted material. Writing-wise, there’s nothing I can complain of. Lobey’s narration has a clipped, even pace and a vocabulary tuned to folk rhythms yet oddly flowered. The dragons hissed out across the City sands. Swamp creatures, they were not used to this dryness. As we plowed the ancient place, silent and furious with hundreds of beasts, I remember crossing a moment of untimed horror, when through void buff I imagined myself surrounded of a sudden, crowded by millions, straited by walls, sooty, fuming, roaring with the dread, dead old race of the planet. This works. It’s not ornate but can’t be called beige. It communicates colour and patterns and feelings. The power of myth is its resonance and what makes me set aside the dilettantism and hope to read more Delany in future is the resonance this story clearly meant to him personally. It’s hard to define, but there’s a sense of care. Delany’s journal indicates he was mulling it over back in 1965 and it shows in the internal scheme – no matter how trippy, the plot hangs together. Small exchanges between characters are made portentous. The majority of the cast is interesting and deserve more development than they got. The landscape of the world is fluid, amorphous, geographically senseless as a dream. Everything has depth, unplumbed as it may be. The Einstein Intersection thus has every necessary ingredient to make me love it and yet somehow the end result is still pretentious pulp fiction. Approaching it with hopes of literary sci-fi was my mistake. But for raw, uncooked talent, the proof is definitely in the pudding. The legion of ideas here have only grown more apparent to me in the elapsing days since completing it. 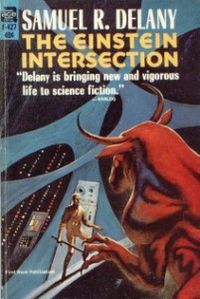 It seems my opinion gels with that of Algis Budrys, who was impressed but still noted that Delany “has about as little discipline as any writer who has tried his hand” at science fiction. My point exactly. I expect far greater things from Dhalgren. He was, after all, quite a young man at this junction. In conclusion, I’d recommend The Einstein Intersection to those looking for something snappy and memorable with a hip counterculture vibe. If you love mythology or want to experience a thinking man’s planetary romance this could also very well be the ticket to bliss. On a rating system, I’d give it three stars but a friendly, hopeful three stars. ***Addendum: Receiving complaints about my label of “pulp” for a work of New Wave science fiction, I suppose I should clarify. “Pulp” in technical terms is just a reference to the type of paper some stories were printed on and is hardly helpful. However, I have read works by Robert E. Howard and Sax Rohmer, two undisputed pulp writers and have noted their chief stylistic similarities. 1. A simple, colorful and not necessarily bad writing style. 2. Continuous action. Situations that never remain static. Pages that turn always to a new development. Rumination cut down to solitary paragraphs, never allowed to sprawl. 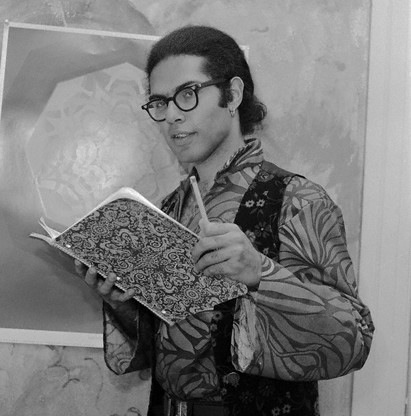 For substance, Samuel Delany’s work is a quantum leap above Fu Manchu or Conan but my chief complaint in the above review is how he boiled down all his many ideas to a very short, action-packed sequence of events – with new scenery, new characters and new developments on every other page. Rumination is kept to a minimum. The writing is quite simple. New Wave sci-fi was apparently deliberately breaking with the traditions of pulp sci-fi, so I am probably giving offense with my label but no artistic transition is instantaneous. Anyway, amongst the books I tend to read, The Einstein Intersection most definitely sits at the pulpy end of the writing spectrum. Whereas reading the first few pages of a 1966 J.G. Ballard novel gives no such impression. Genres and labels are highly constrained and I prefer to use them as description rather than fact. Calling Emile Zola’s Therese Raquin a gothic crime novel is factually wrong when the author and audience meant it for naturalism. But it doesn’t act like naturalism. It acts like a cross of Poe and James M. Cain. As a self-trained non-expert non-academic, I am perfectly at ease relying on my own judgment in these matters. The Einstein Intersection, to me, behaves a lot like pulp even though technically it isn’t. Hopefully this clarifies what I mean when I throw the word “pulp” around.